This lesson plan helps students determine what rights are protected under the First Amendment by encouraging them to ask themselves: how are First Amendment rights relevant today? How are First Amendment rights relevant to me? A two-day plan that looks at the guarantees the First Amendment affords, then asks students to find examples of those guarantees in action. 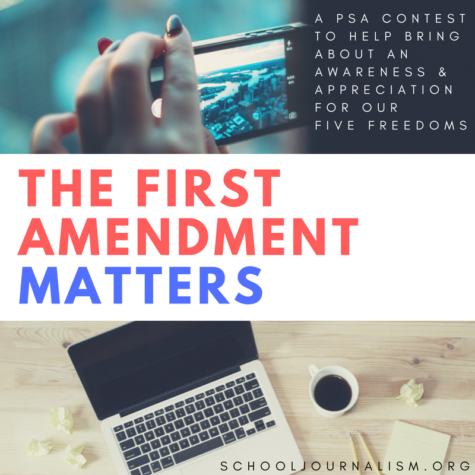 This lesson will gives students the opportunity to learn more about the rights and responsibilities provided by the First Amendment through exploring how teens have successfully and unsuccessfully used it to defend their actions. A unit focusing on the First Amendment and its five freedoms. It asks students to explore the freedoms, ask others about them, and see how the First Amendment applies to everyone — even them. A great opportunity to bring outside speakers into class. This lesson plan focuses on the definition of libel, why libel is so potentially dangerous for journalists, how journalists can avoid libel, and libel’s to media ethics overall. A unit designed as a broad introduction to basic newspaper issues. High turnover can cripple institutional memory — this unit is designed to give everyone a good basic understanding. A one- or two-day lesson (part of a five part unit). This one focuses on the ethics behind the use of hidden cameras to tape alleged wrongdoing. It also touches on libel. Can student publications be sued for libel? You bet they can. This lesson examines three hypothetical cases and asks students what they would and wouldn’t publish. A lesson to be used near the beginning of the year that touches on ethics, press law and other fundamental topics in journalism. Journalism students need to know how plagiarism affects journalism. This lesson will give students practical guidelines and insight for journalistic publication.